Hate layovers? Think again. This Traveling Mom shows you how to turn the layover into a one-of-a-kind experience. 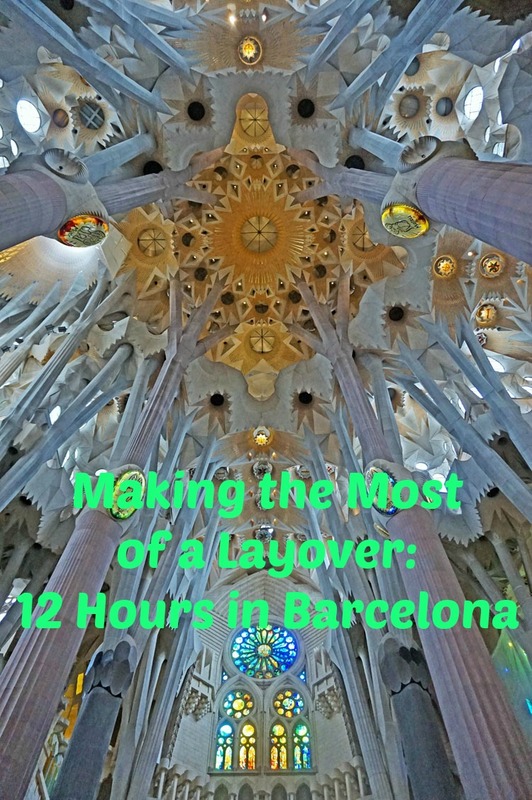 Join her on a 12-hour visit to beautiful Barcelona Spain. 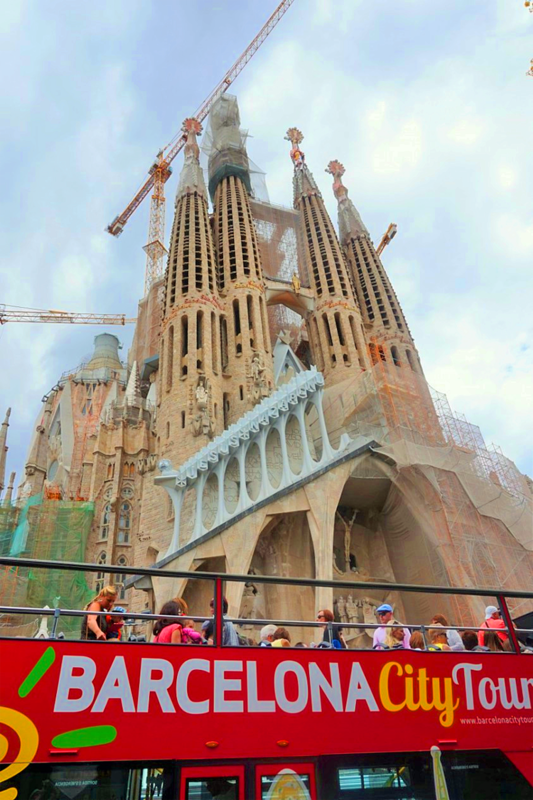 It’s dominated by famous landmarks of Antoni Gaudi. 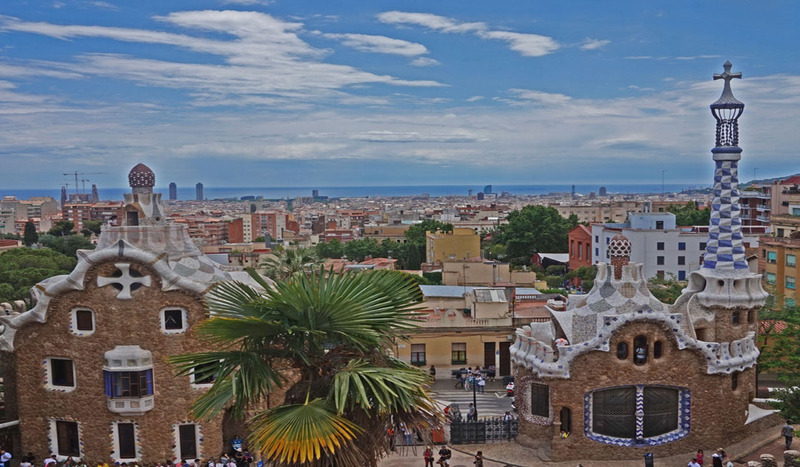 Visit two of them, Park Guell and Sagrada Familia Temple. See how his design genius can take you on a journey of imagination. 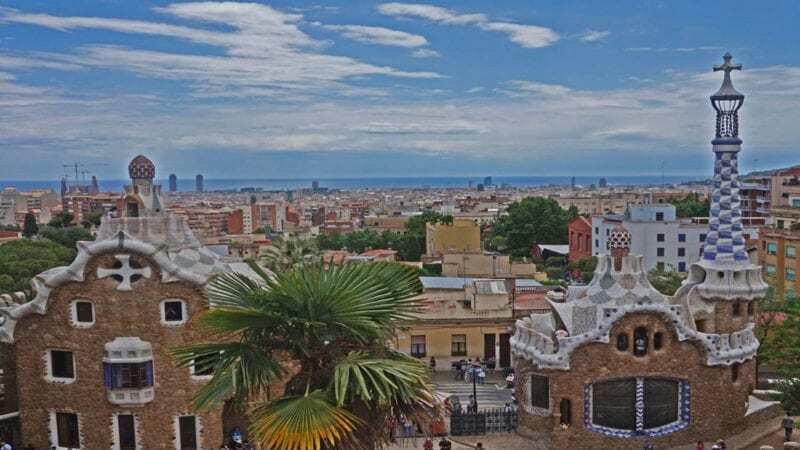 For years, Barcelona Spain was high up on my bucket list. In the reality of life, it became a distant dream. That is until last summer, when I had a layover between flights and decided that a short visit is better than none. If you want to add a destination to your flight, look for the longest layover time. Then identify the airport code to see if the spot is interesting for you. If you are traveling far, you will often see more than one option. Pick the one you like and you are on your way! When putting together my trip to the Island of Zakynthos in Greece, I was using my American Airlines miles to buy my plane ticket. The beauty of using these miles is that your ticket may include multiple stops at one price. I needed two stops to get to the island. The shortest available combined time was 20 hours. In such a scenario, I would spend my time between planes at the airports. I did not like that. Instead, I went the opposite direction and looked for the longest possible travel time, which would allow for the layover to last overnight somewhere in Europe. I chose to travel for 32 hours. 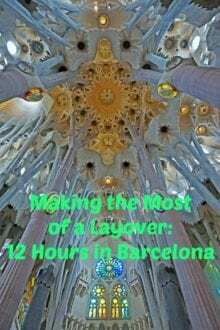 The layover would be 12 hours during the day in Barcelona Spain. Staying overnight there would be ideal, but the best I could do was to spend a day there and take my next flight at night. See here how to make the most out of your frequent flyer miles. I took an overnight flight from Philadelphia. In order to travel light, I checked in my suitcase to go straight to Zakynthos. I was only carrying my backpack with my laptop, a change of clothes, and few toiletries. I arrived in Barcelona Spain at 8am the next day. I left my backpack at the airport, paying 10 Euro for secure storage. If my plane was late, I would skip this step. The backpack was light enough to be carried all day. I took my camera, my phone, passport, the next segment’s boarding pass, credit cards, and plenty of Euro and left the airport to explore the city. Read about places you wish to visit. Is there a long wait to get there? Can I buy tickets online? 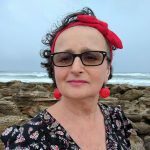 How much time do I need to get there? Then plan your itinerary accordingly. I paid 30 Euro for a taxi from the airport to Park Guell and arrived two hours before my scheduled time to enter. I already had my ticket, which I bought onlne from the USA. I was glad I did. If I had waited to buy my ticket there, the earliest entry was 4 hours away. When selecting my entry time, I added three hours to my scheduled landing time to allow for late arrival or city traffic. I tried to walk in sooner than my ticket allowed, but the park’s rules are very strict. They will not let you in even a minute before your assigned entry, and you only have half an hour to enter after the scheduled time. If you miss this window, you are out! There are no restrictions on how much time you can spend inside. A large portion of the park can be visited for free, so this is what I did while awaiting my turn. 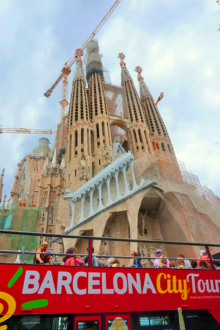 There is a lot to see in Barcelona but I decided to see only two of its major attractions. It is important for me to get the feel of places I visit instead of running around trying to squeeze in as many attractions as possible. Overloading also puts you at risk if something goes wrong. 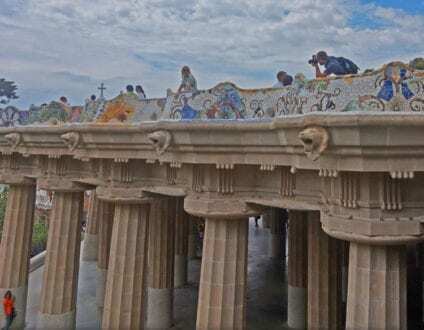 Park Guell was my main reason to visit Barcelona. Based on Internet pictures, I became fascinated with its colorful fairy tale architecture. When I finally walked in, it felt like I stepped into a story book. The scenery was dominated by shades of blue. There was a beautiful blue sky, a distant view of the blue sea, and the amazing architecture with pops of blue everywhere. The park’s enchanted atmosphere takes you to another place where everything is nice and cheerful and your only worry is how to play. I appreciated the fact that the number of people was regulated. It allowed for a more personal experience. Sagrada Familia was my next step. I took a short taxi ride there for around 10 Euro. Its con struction started in 1866 and it is scheduled to be completed in 2026. I was not aware that long projects like that still existed in today’s world. After my first look at the exterior, I know why it is taking so long. It is a very complicated and heavily ornamented structure. When I walked in, I could not believe my eyes. It was unlike anything I have seen before. 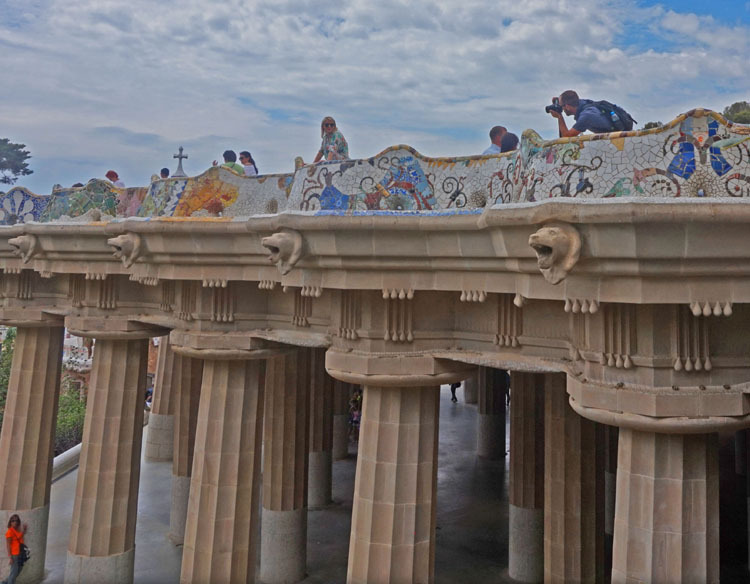 This is where Gaudi’s genius comes through. His ideas were ahead of time when he was alive and are modern even now. The décor is busy but airy at the same time. The interior is all about the ceiling. For me, it looks like heaven. I felt the presence of angels. I felt eyes following me. I was waiting for the sky to open and for something unearthly to happen. I could swear I heard the music, but I knew it was not played. I am not that religious, but it was a divine experience triggered by the power of art. 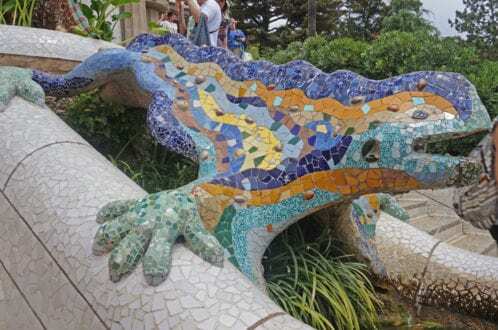 See more attractions for family fun in Barcelona. Back on earth, I finished my day in Barcelona with a well-deserved meal at Café Picasso next to the cathedral. I took my time to enjoy traditional Spanish food and the vibe of the city. Missing a plane can derail your vacation. I took a taxi back to the airport four hours before my next plane to make sure I had enough time to get my backpack and go through security. Everything went smoothly. Around 8pm, I flew to Vienna just to spend a night there at the airport hotel before my final connection to Zakynthos the next morning.